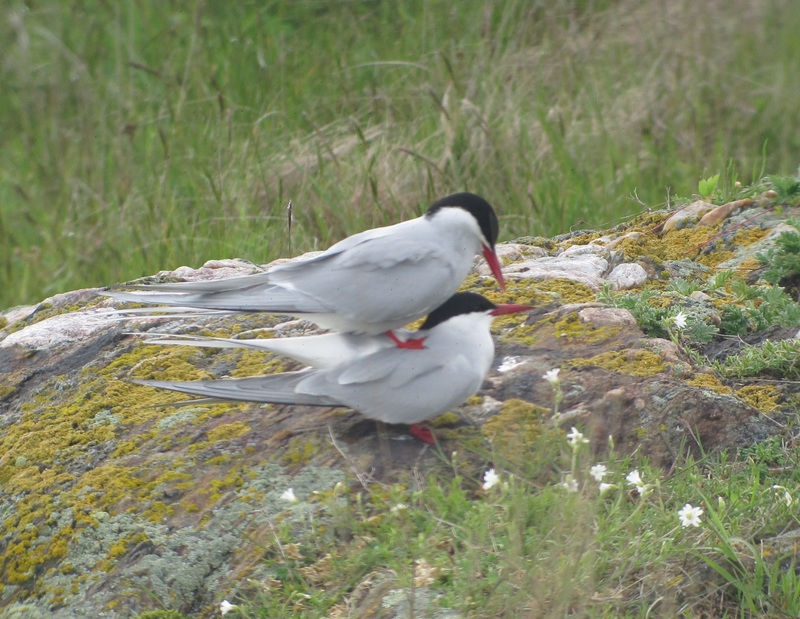 A pair of Arctic Terns between copulation attempts. Finishing in a close second, we found our first egg this morning on Metinic! Petit Manan did a fantastic job discussing the Tern egg and its camouflage (see below), so we won’t bore you with repetition and instead highlight a few differences. 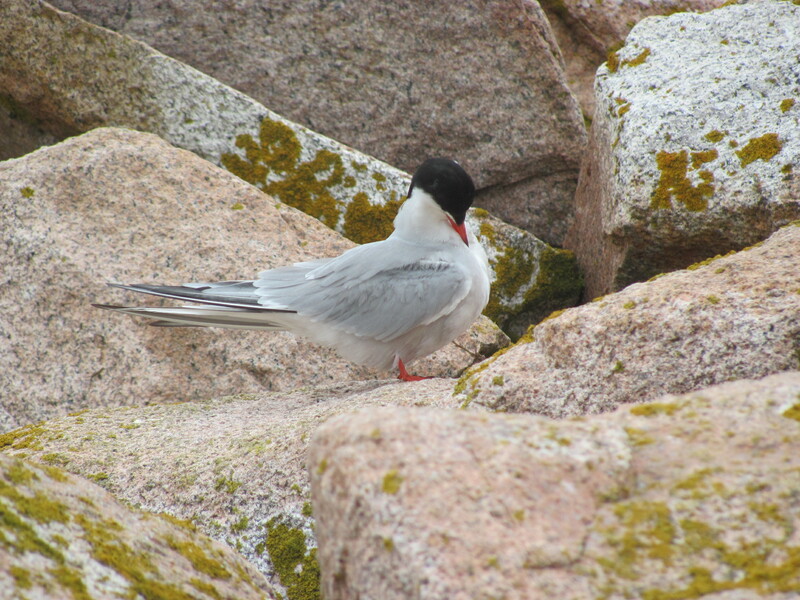 This little gem belongs to an Arctic Tern, and here on Metinic they prefer to nest on the exposed granite ledges in the center of the colony. 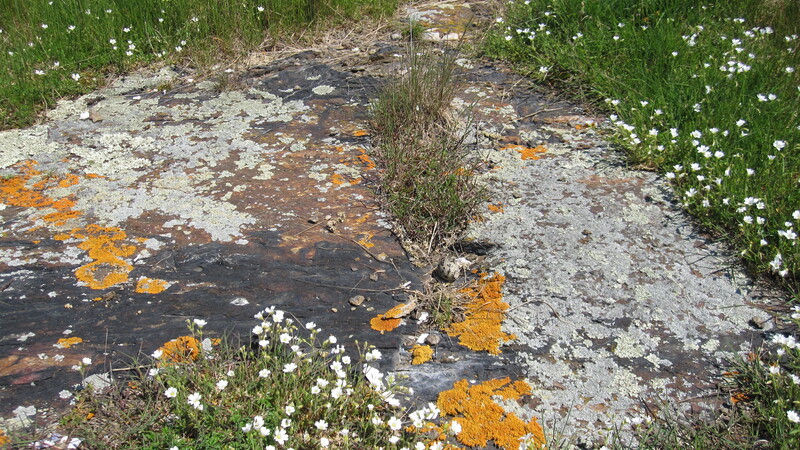 On one of the many granite outcroppings, the egg has very little protection from the elements or predation. Many times there is almost nothing to an Arctic Tern nest, and the eggs will just sit in a rocky depression. Here the camouflage does very little for the egg’s protection, but being located in the center of the nesting area provides enough protection in itself. Terns are aggressively territorial so most nest predation occurs on the colony fringes. These Arctic Terns rely on a buffer from their even more aggressive Common Tern neighbors to chase off predators before getting to their eggs. Looking forward to an Easter egg hunt as June begins! 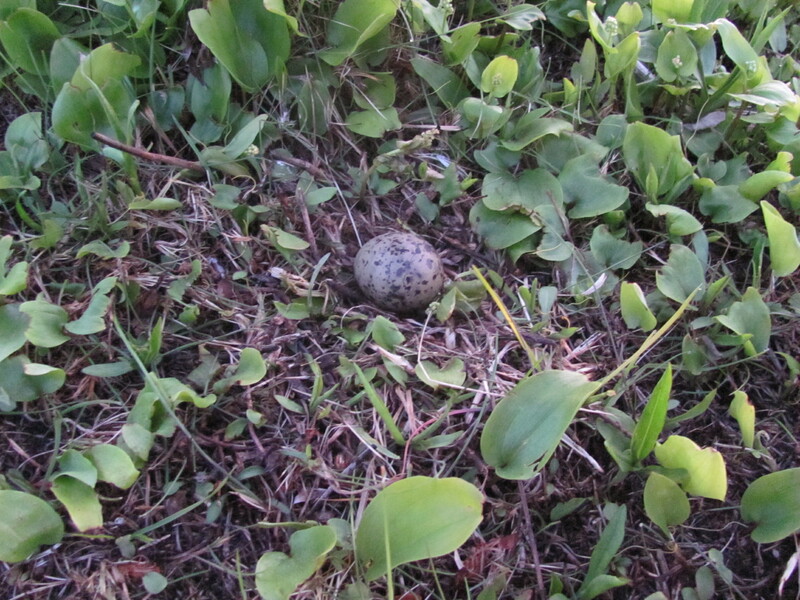 During our evening perimeter walk today, we spotted the first Common Tern egg of the season! This little speckled beauty is about the size of a walnut and is amazingly well camouflaged. The creamy base color of the egg matches the minimalistic dry-grass nest perfectly, while the soft-toned speckles help it blend into the shadowy substrate. 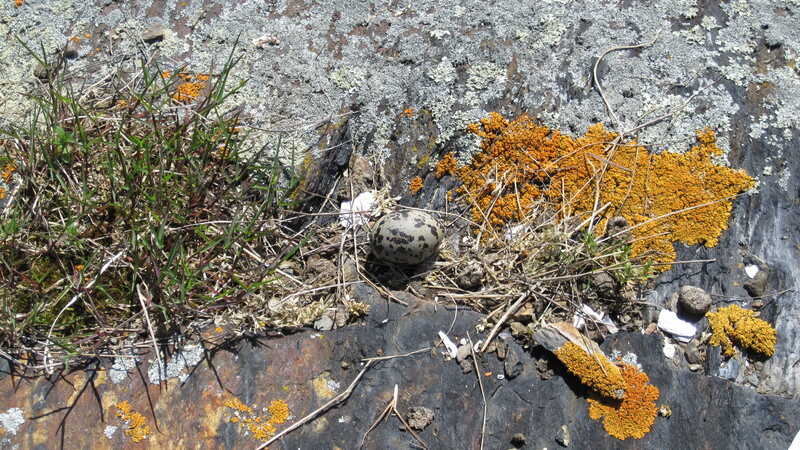 Tern eggs are predated by Herring Gulls, Black-backed Gulls, and Laughing Gulls, all of which frequent PMI, so this cryptic camouflage is critical to the survival of the little tern-to-be. Keep checking back for updates, because you know what comes after eggs……… chicks! Sometimes the field kitchen can be your best friend. Many people assume we are out here eating ramen for dinner and I am here to dispel that myth. Here on Metinic we feel that family dinners are important not only for time efficiency but keeping a cohesive and happy crew. Cooking for yourself and others can help you eat healthier, use veggies creatively, conserve fridge space, and learn new recipes from your crewmates! Here is the first recipe from our season we would like to share with you. It only takes a little bit of care to turn something simple into something scrumptious! 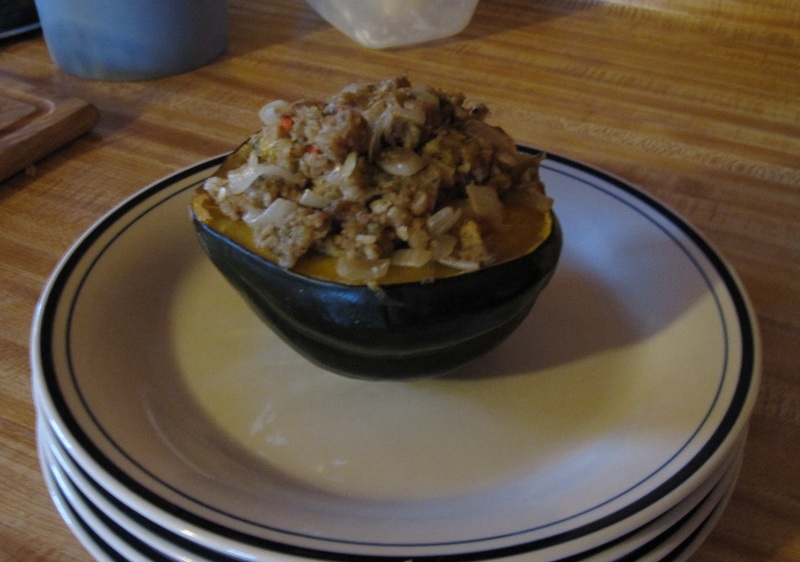 First, halve the acorn squash and remove the seeds. Once clean, add a dash of nutmeg and two dashes of cinnamon to each squash half. Peel the orange and cut the segments into half inch pieces. Line each squash half with some orange pieces and a tablespoon of honey. Place the four halves into a glass baking dish and cover with tin foil. Bake at 400 for about an hour or until tender but not completely cooked. During this time finely chop the onion and sauté in 1 tablespoon of butter 2-3 minutes until just becoming translucent. Add several tablespoons of sage until onions are thoroughly coated in sage and butter. Cook the stuffing as per box instructions, then combine with onions. When the squash is tender, stuff ‘em! Return to oven about ½ hour or until squash is thoroughly cooked. Enjoy! Petit Manan Island is a great place to watch spring migration as birds travel through the Gulf of Maine heading northward – many of them on their way to breeding grounds in boreal forest, taiga, and tundra habitats. We’ve sighted many exciting migrants in the past few weeks, especially warblers including: American Redstarts, Black-and-white, Yellow-rumped, Common Yellowthroat, Magnolia, Wilson’s, Yellow, Blackburnian, Black-throated Green, Black-throated Blue, Blackpoll, and Chestnut-sided Warblers. The fog has been heavy for the past few days, so many of the birds that stopped over on the island have delayed their departure, which means we have had extra time to view these distinct, colorful avian wonders. 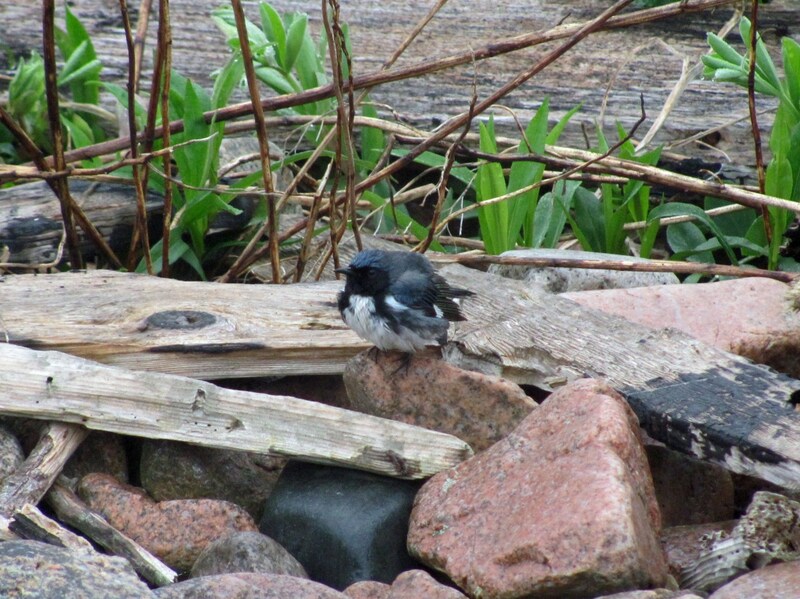 The Black-throated Blue Warbler pictured has been fastidiously feeding on insects at the north end of the island for at least three days now while waiting for the weather to break. 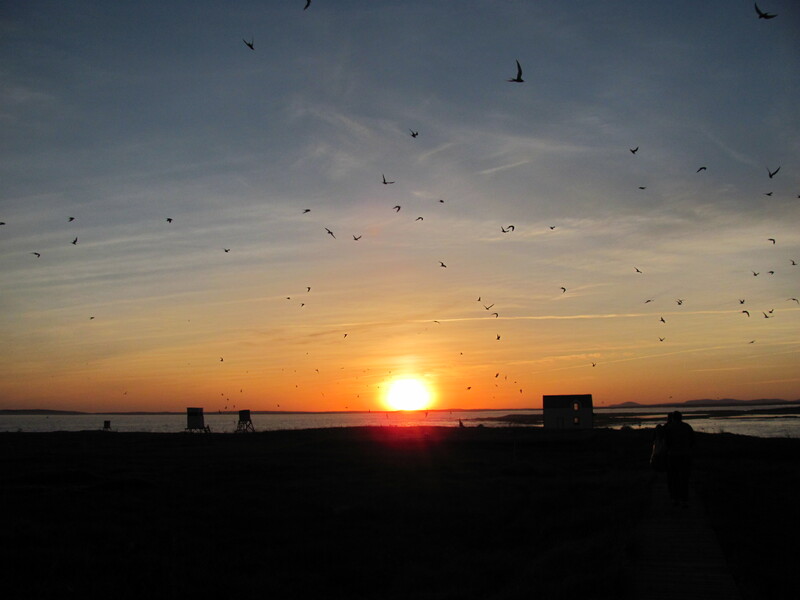 The migrating passerines have kept us on our toes and the binoculars glued to our faces. Stay tuned, we have a full season ahead! 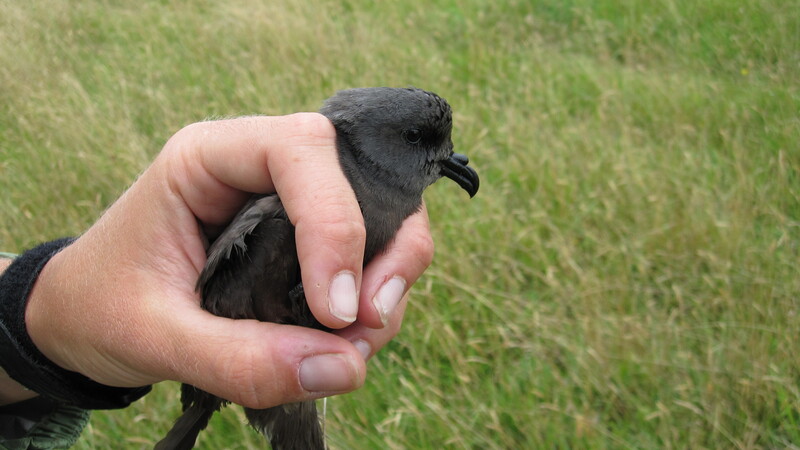 Leach's Storm Petrel I found in the Tern colony 2010. Notice the tube shaped nostril on top of the beak. Our first research post is about one of the more elusive species nesting on Metinic. Leach’s Storm Petrels belong to the tube nosed Order Procellariiformes, and are related to Shearwaters and Albatross. Petrel burrow found under a piece of driftwood near the south cove. Yellow flags are used to mark and number the burrows. Most of you have never seen one of this species before, it’s even difficult for us researchers to see one without night vision, though they are living underneath our cabin! That’s right, not only do Leach’s Storm Petrels nest in burrows underground, but they are nocturnal! Petrel burrow under old stone wall. 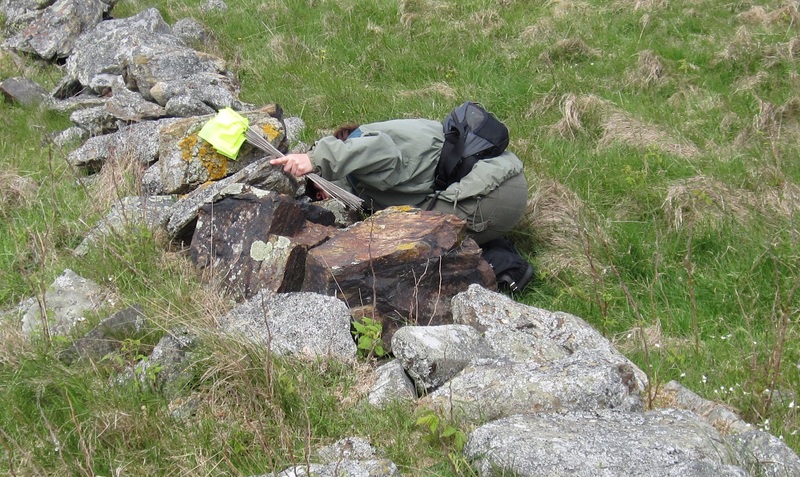 With the number of cracks and crevices, smell is the only option for identifying a burrow in use. So how do find a bird that isn’t above ground while you’re awake? THEY SMELL!!! Imagine a mix between moth balls and old books… My reaction was precious the first time I was told we would be finding burrows by smelling holes, but to be honest, you will smell a burrow before you see it. Jennie smelling for Petrels despite finding a Garter Snake on her 4th hole. She puts Indiana Jones to shame! 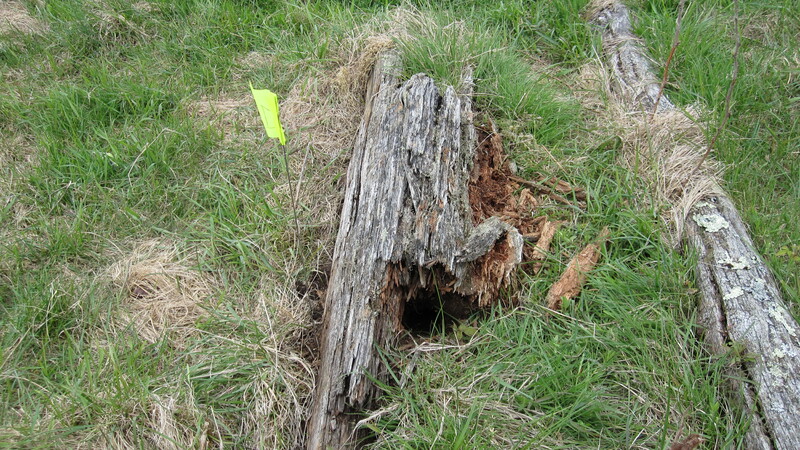 Usually burrows will be under a large stone or tree to prevent collapse or compression. 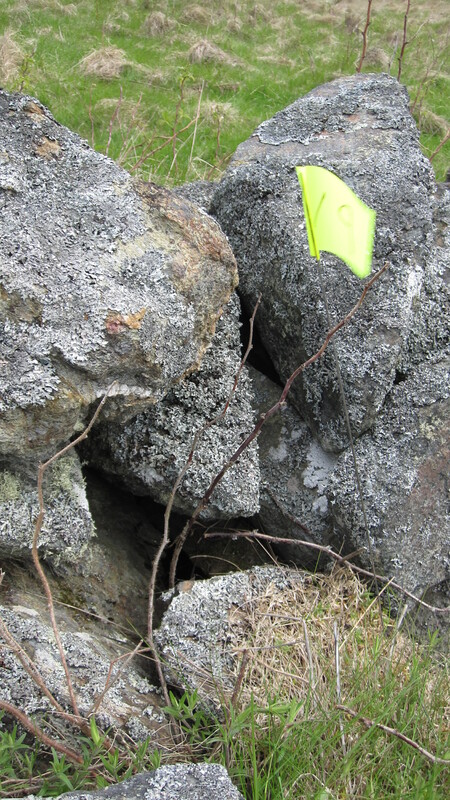 Luckily the old stone walls on the island provide excellent nesting habitat, and many of the Petrels choose to burrow under them. We were able to find 53 burrows in just one afternoon, and the smell was stuck in our noses for the rest of the day. 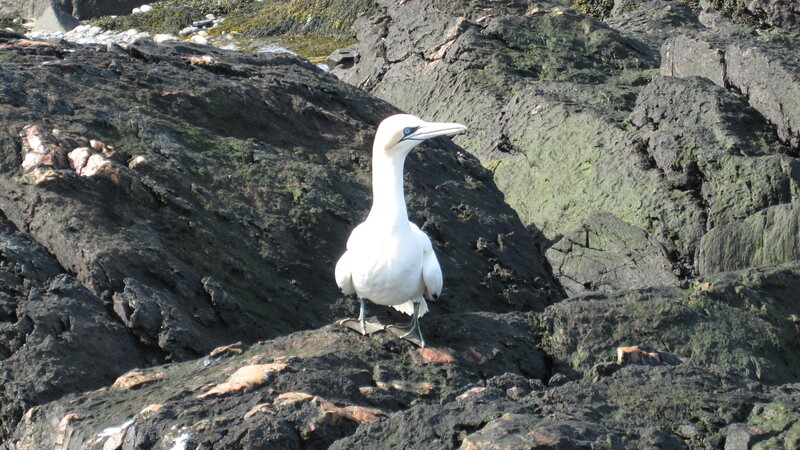 We had an unusual visitor on the island yesterday, a Northern Gannet! This handsome fellow let me walk right up to him and take his picture! (I think he heard about the blog.) Expect our first research and recipe posts soon! One of the things that makes work on Metinic unique is sheep. That’s right, sheep. The herd of over 100 ewes and lambs is here because the island is shared with private land owners. 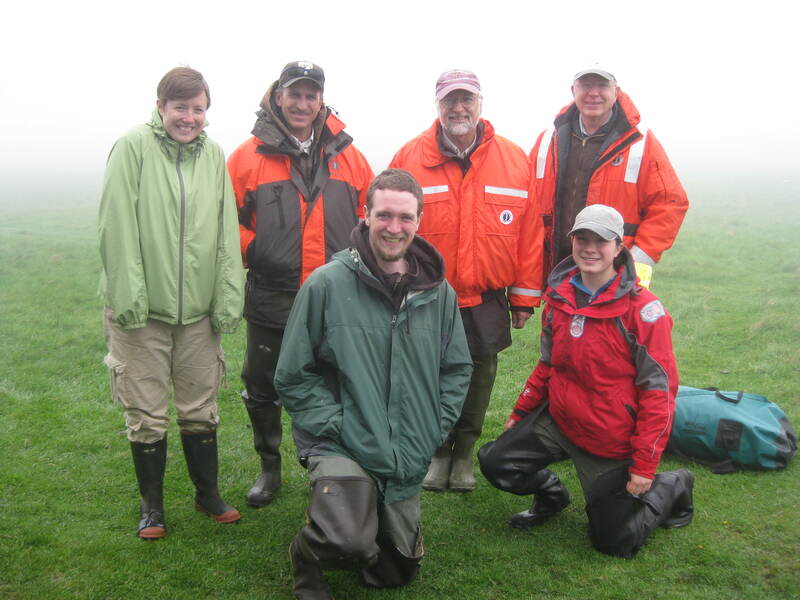 These “South Enders” are a friendly and helpful group, and we couldn’t ask for better neighbors. As we prepare for the Terns to arrive and settle, few undertakings are as important (or as unpredictable) as the annual sheep round up! These organic lawn mowers do us a great service by managing vegetation height year round, which provides great seabird nesting habitat, but Terns are extremely territorial and will exhaust themselves attacking sheep if they are present in the colony. 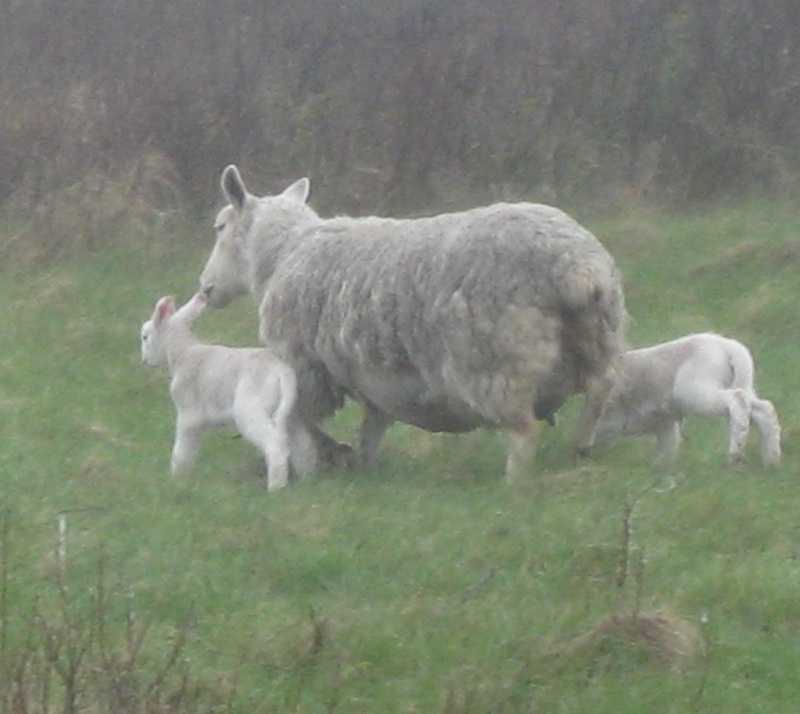 This is not without good reason; sheep can accidently step on nests and chicks while grazing. Shepards, Back Row L to R: Courtney Viall, Brian Benedict, Bill Kolodnicki, Tom Goettel. Front Row L to R: Charlie Walsh, Jennie Wiacek. Not pictured: Michael Langlois. Playing shepherd on Metinic is not exactly the picture you probably have in your head. There are no dogs, and the field is a hilly thicket of Bayberry bushes. Some of these sheep have very young lambs and they must move slowly, so moving them down the east coastline and beyond the fence is as much a practice of patience as it is ingenuity. The roundup went off without a hitch this year, thanks to the crew, refuge staff and enthusiastic volunteers.